Takeo has vowed to help Yamato and Suna become a couple, but when he tries to talk to Suna about what he likes in a girl, Suna isn’t much help. Takeo and Yamato’s first meeting alone leaves Takeo incredibly confused when Yamato starts crying. He thought she wanted advice about Suna, but it looks like he may be wrong. Takeo is over the moon about his new relationship! But his true mettle is about to be tested when a major accident occurs during a meet up between his and Yamato's friends. Ai, Sunakawa’s sister, visits home and reacts interestingly to the news that Takeo has a girlfriend. On top of that, Yamato is acting a bit odd, and only Ai seems to notice. Yamato's been acting unhappy of late, and even Takeo has noticed. But her worries might be quite different from what those who know her would think. When second years in the Judo club ask Takeo to help them, he agrees without considering that the month-long training will lessen his time with Yamato. It’s almost Yamato’s birthday! 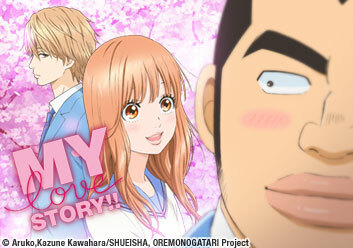 With Suna’s help, Takeo plans her birthday date, and even gets a job. But Suna’s acting odd and won’t tell Takeo what’s wrong. Now aware of what is plaguing Suna, Takeo tries to honor his friend’s request to follow through with the plan both of them worked so hard to create for Yamato’s birthday. While Yamato and Takeo are on a picnic in the mountains, a mishap causes them to get lost. Takeo swears to get Yamato home safe, but Yamato is freaking out for another reason. Takeo and Yamato join their respective groups of friends for a beach trip! Takeo is certain they will all have a great time, but Yamato has a particular plan. Takeo’s never really considered his future, but he amps up his studying when Yamato mentions how cool it would be to attend the same university. With his job, Takeo's got some extra cash! However, his hopes to take Yamato to a theme park are dashed for a very peculiar reason! Accompanied by Suna, Ai and Oda to make the visit “not a date”, Yamato and Takeo venture to an amusement park! However, Oda has a plan to help Ai confess to Takeo. When a not-so-speedy classmate is assigned to his relay team, Takeo takes her under his wing to help her improve. But she might begin appreciating the help a little too much. Saijou is unsure whether or not to tell Takeo something important. Even so, she helps Takeo make a discovery about his feelings for Yamato. Kurihara's personality works against him when trying to impress Nanako at the Christmas party. She isn't the slightest bit interested and can't wait for the party to end.